Click here to download September’s printable flyer to share with all your neighbors, friends and families. We were all mesmerized and during the whole process you could hear a pin drop! It was as if all 150 of us not only recognized the monumental historic significance of this, but I believe we all knew this was helping all of us to open up our channels to receive, as well. Lunch was superb. The sun was shining and many of us took our plates outside, some sitting on the grass and some on the box-shaped weights (seat 2 at a time) that secured the tent we would return to after lunch to hear Barbara’s words of wisdom. I sat with a Connecticut colleague who is very intuitive and she informed me that she witnessed incredible surges of beautifully-colored energetic flows and a room filled with higher beings, light beings and orbs throughout the whole morning and especially when Oscar was seeding Barbara. We returned to our seats and as Barbara began her presentation dark thunder clouds rolled in from above the lake and hid the sun we so enjoyed at lunch just a few moments prior. Within minutes there were strong winds competing for our ability to hear her. She began shouting her words of optimism and her excitement grew with the increasing intensity of the storm. The sound crew kept turning up the volume and finally gave her an additional hand-held microphone, which helped, but the storm’s intensity grew. Barbara began by letting us know how profound the morning’s experiences with Oscar had truly been for her. She informed us that she believed that it helped her to experience her own sense of consciousness in a vertical, less horizontal way, i.e., where she believes the answers to our planetary crises are. 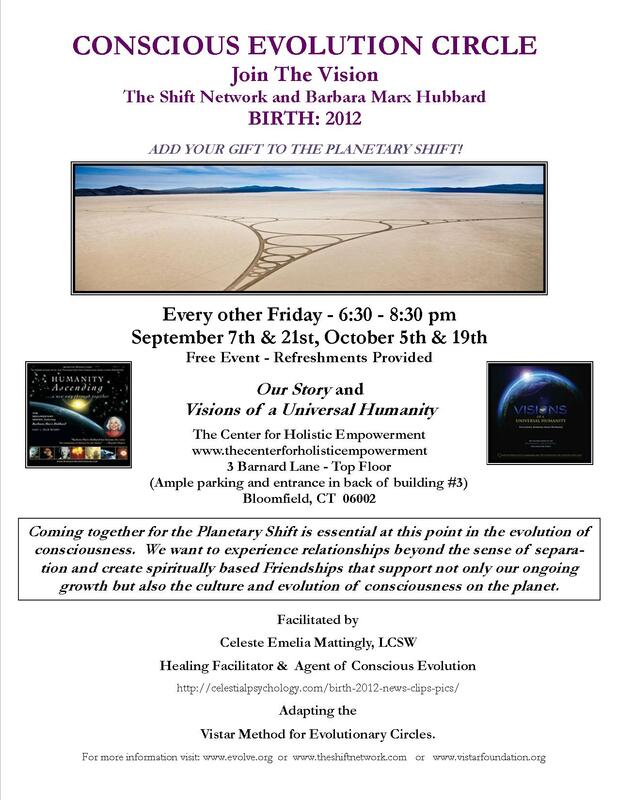 She shared the story of her new book, Birth 2012 and Beyond: Humanity’s Great Shift to the Age of Conscious Evolution, which is already in 4th place on the Amazon Best-seller list. She spoke of her vision of December 22 as being the B’earth-day of the New Humanity. A new humanity that understands that it not only has the power to completely destroy itself as with nuclear power, but also understands that it has the power to completely create itself as well, with deliberate, conscious evolutionary thoughts, words and deeds. Her vision is that on this December 22 B’earth-day, the New Human(s) will begin to (continue to) stand up and declare total responsibility for being human beings that co-create reality because they have become conscious of themselves as consciousness. On page 49, she writes, “The reason for Birth 2012 is to awaken enough people to this amazing good news … To fully awaken, we need a shared peak experience or a mass spiritual experience of expanded reality… of our wholeness, oneness, and goodness [to] become a collective awakening during our Planetary Birth process and celebration.” And that afternoon we had just that- a shared peak experience… While Barbara was sharing her excitement for the ideas that have been her life’s work, the winds were continuing to howl – we could feel the strain on the tent structure as the support poles and the floor were quivering. The maintenance crew kept busy securing the side flaps to keep the torrential rains out. Some folks left the structure for the shelter of the main house. The rest of us remained in trust not wanting to miss a moment of Barbara’s wisdom. I was reassured when I thought of how secure the large blocks we sat on at lunch had been. I was also struck with the synergistic symbolism of the moment- here we were being inspired to assist in the aversion of global planetary crisis in the middle of a tremendous mountain-range storm. I kept thinking about what a tremendous gestalt we were experiencing and that no matter what happened it would turn out all right because it’s all part of the ‘birthing process’. How serendipitous! Then, the most amazing and affirming thing happened that I have ever experienced and that I hope was evident on the live-stream and will soon be available for You-tube viewing – and I am sure will go viral instantly! At the peak of the storm Barbara began to speak about the amazing process of convergence, especially heart convergence. She taught us a simple exercise- hold out our left hand for receiving and place our right hands over our hearts. Just at the exact moment when we all (about 150 of us) placed our hands on our hearts, the wind stopped! And the rain went from torrential downpour to a light drizzle! Jaws dropped! Eyes bugged and there were sighs of relief and little outbursts of joy all around the room. It was truly a defining moment- the shared peak experience that is capable of creating collective awakening- creating the Shift we are all so excited to be Evolving toward. It was a defining moment that I will never forget and one that I hope to portray everywhere I can. Igniting and stoking the evolutionary flame has been my life’s calling also, albeit via the individual rather than the global as has Barbara’s. The Holy Work of Consciousness-Raising as defined or outlined in Celestial Psychology® is all about moving from ego to essence. Barbara’s work has always made my heart sing, as I mentioned in my prelude to singing for her* on that fateful Sunday. However, it’s more than that now, as I have begun to deepen my commitment by starting the Agents of Conscious Evolution (ACE) class. This past Wednesday’s Module 9: Co-Creating the “New News” of What is Working was awesome! The news of Evolution- what are we doing individually and collectively? How are we the News of the Evolutionary process? Now you can see why I just had to write about the weekend which, as I stated above, I believe was a moment in history that will become one of the greatest stories of evolution, ever. This experience has contributed to my Shift and I hope to continue the ripple effect. At our Center for Holistic Empowerment we will soon be hosting Conscious Evolutionary Circles- stay tuned for details! There is no better time than NOW to take this to a global level! Let’s all be sure and post, tweet and Youtube all the Evolutionary good news possible! Looking forward to a grand B’Earth-day Celebration- December 22, 2012. Whoo hoo! Let’sss paarrrty! But that’s not you! And that’s not me! to shed ego- our local selves. to become our Divine Essential Selves. After 26,000 years- in this 2012 time of great shift- do we have anything to fear? Absolutely not, because the New Human is here! Conscious Evolution is the way we will survive!